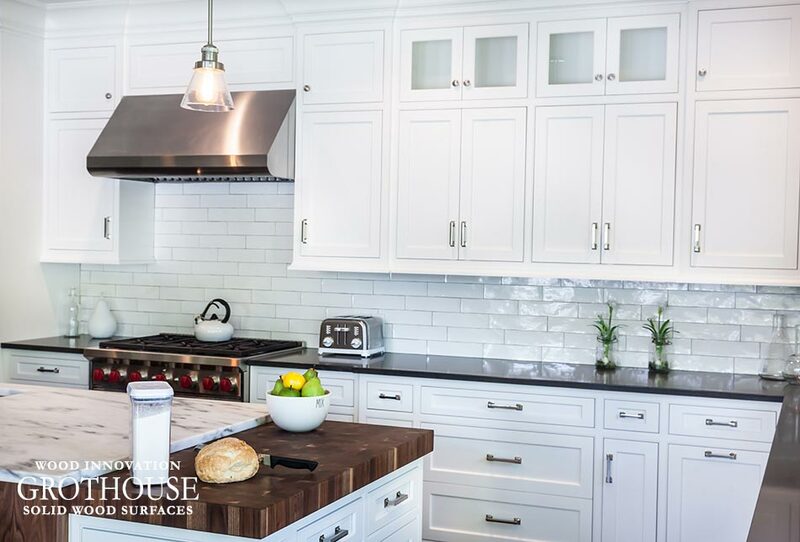 Black White Kitchens feature a classic color combination that is timeless and sophisticated. 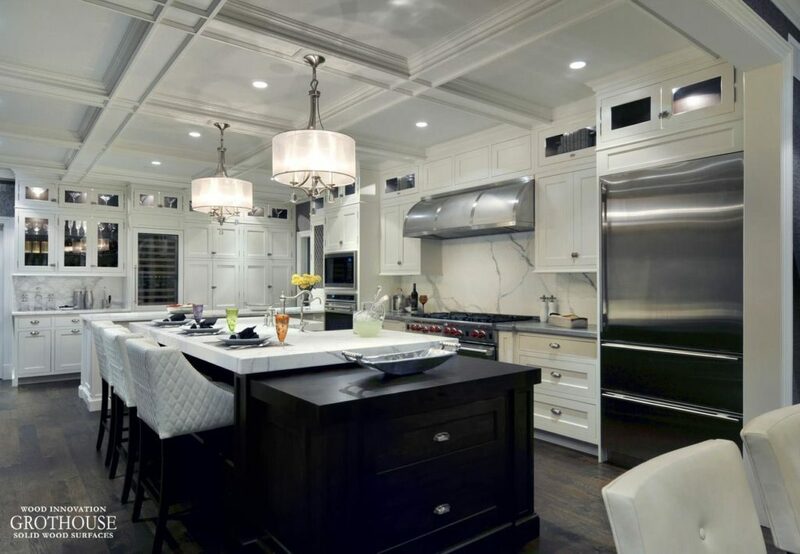 Designers often use wood as a point of warmth among an otherwise cool-toned white and black theme. 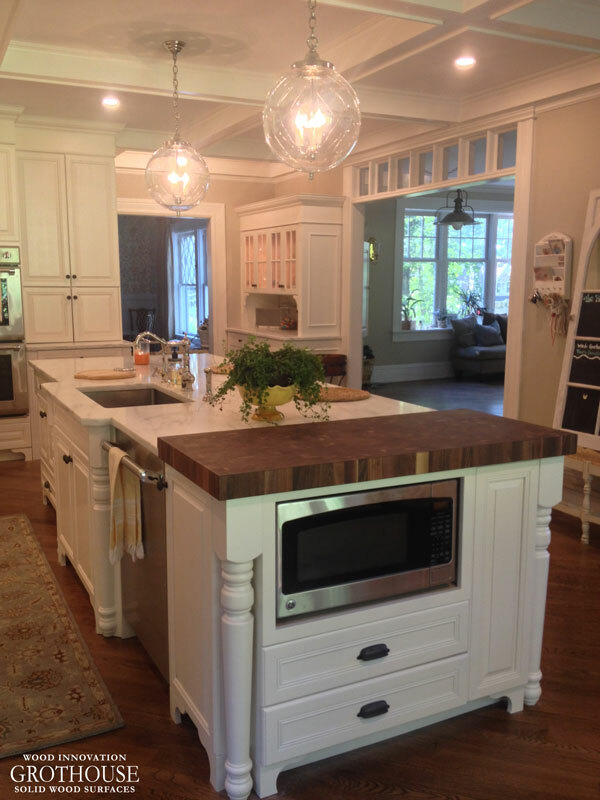 Here are some black and white kitchens including wood countertops and butcher blocks. 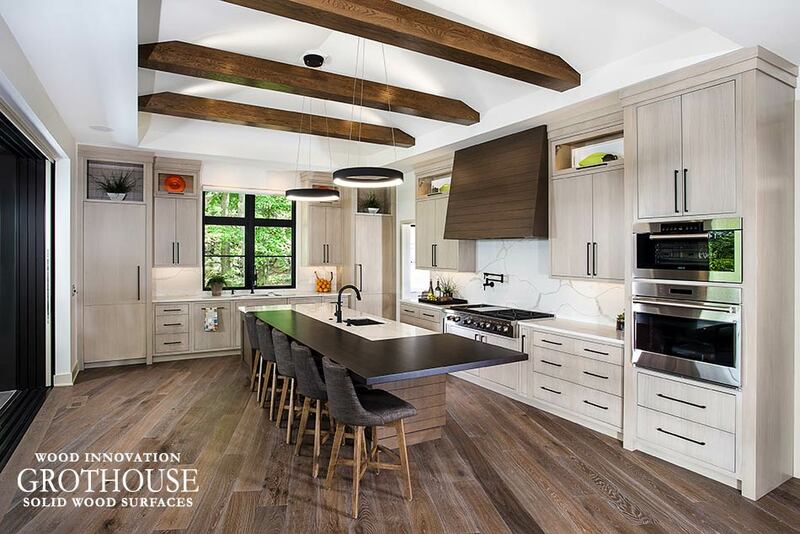 Stonington Cabinetry & Designs blends natural materials with modern finishes, using wood as a point of warmth among an otherwise cool-toned white and black theme. 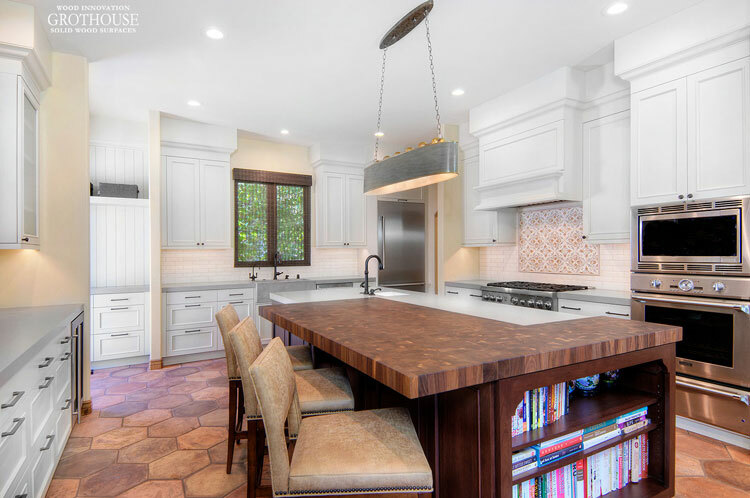 A Walnut Butcher Block matches the floating shelves and kitchen island cabinetry. 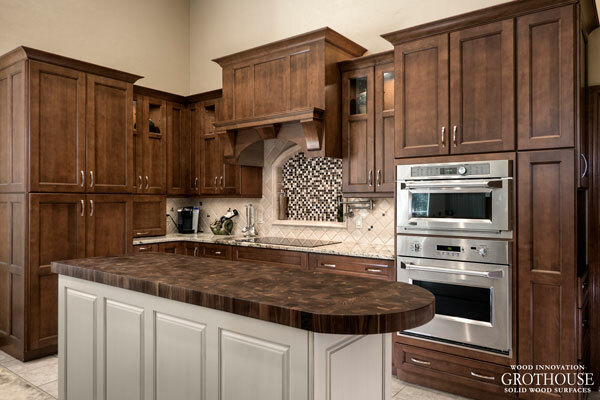 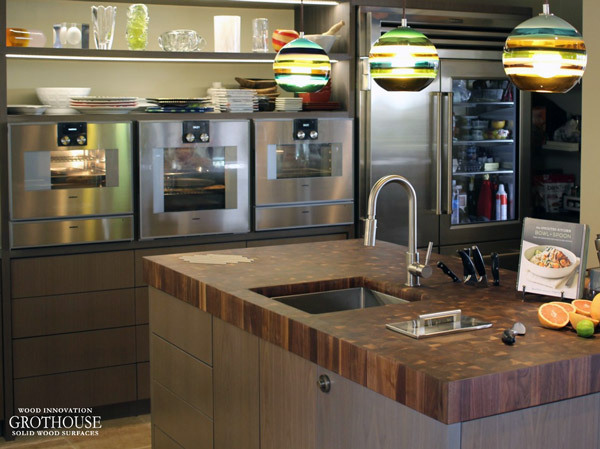 Showcase Kitchens chose a Wenge Butcher Block for the end of the island in this elegant kitchen. 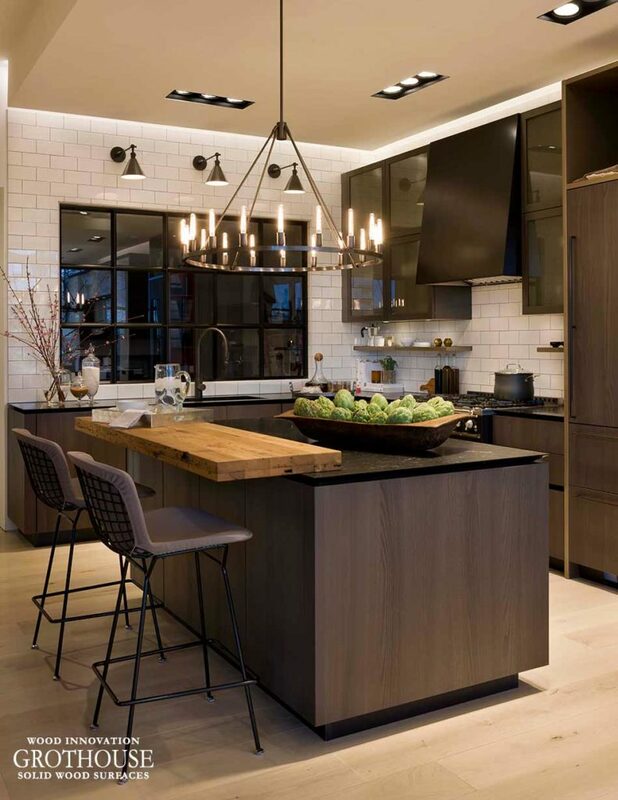 This black and white design is crisp and clean, while providing drama and contrast. 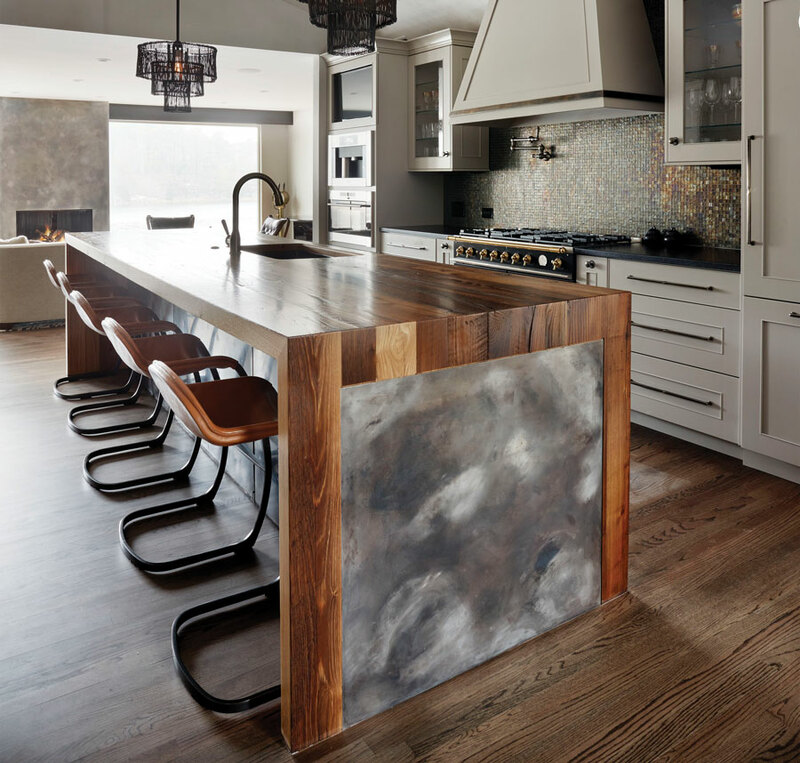 For House Beautiful Kitchen of the Year 2014, Steven Miller designed this mostly black kitchen. 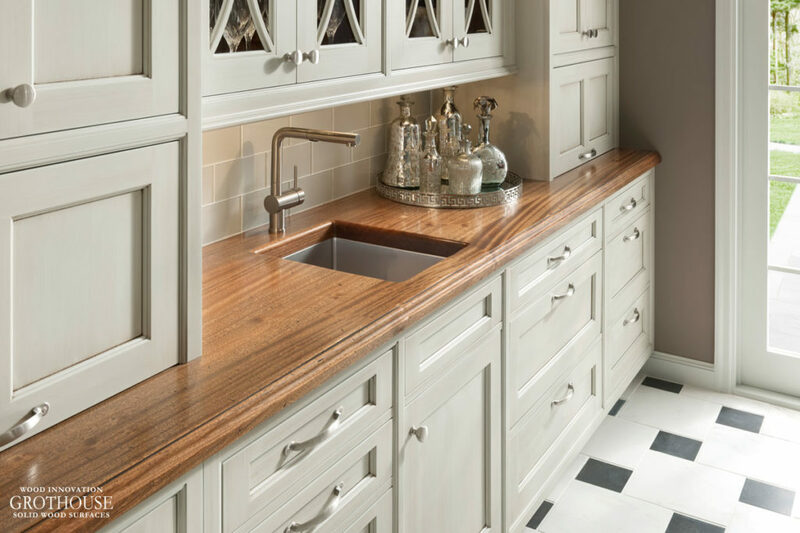 Featuring a Peruvian Walnut counter and matching shelves, the wood keeps the black and white aesthetic from appearing too stark. 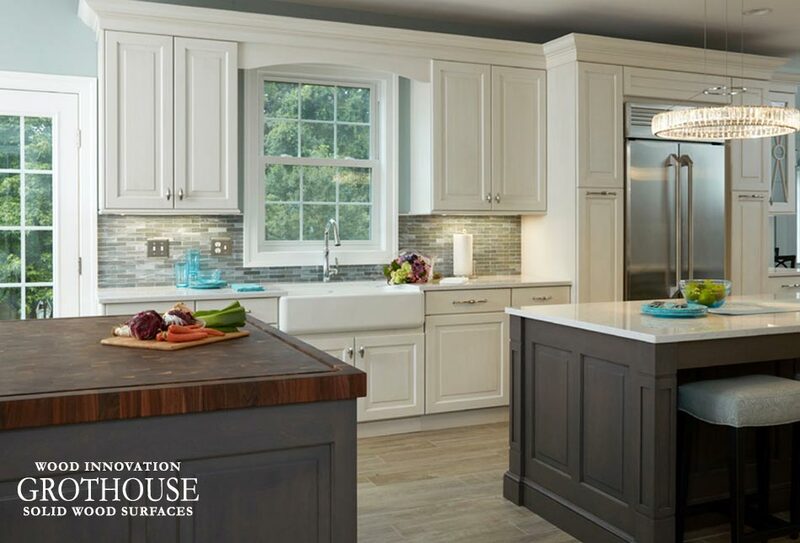 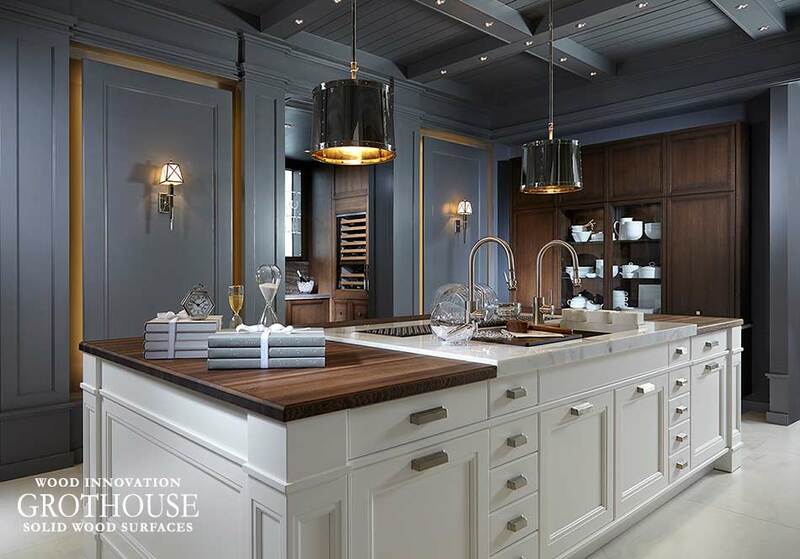 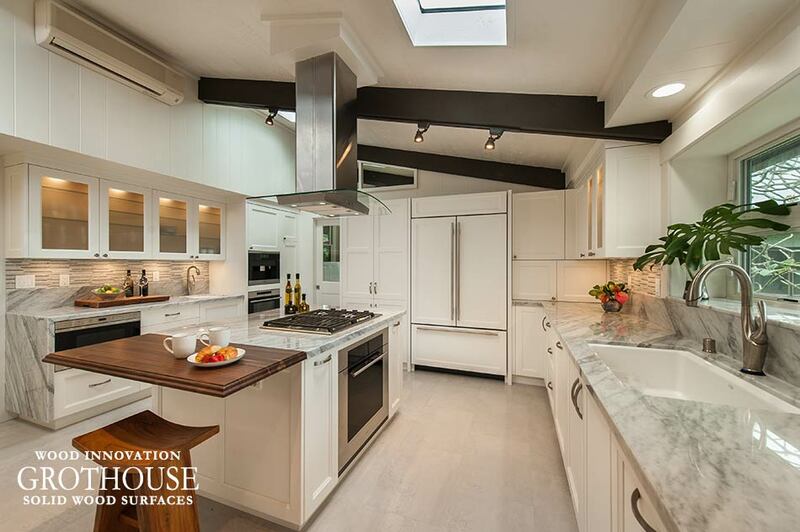 Grothouse was selected to craft a Sapele Mahogany butcher block for this black and white kitchen in the Newton Centre Project by This Old House® Television Show. 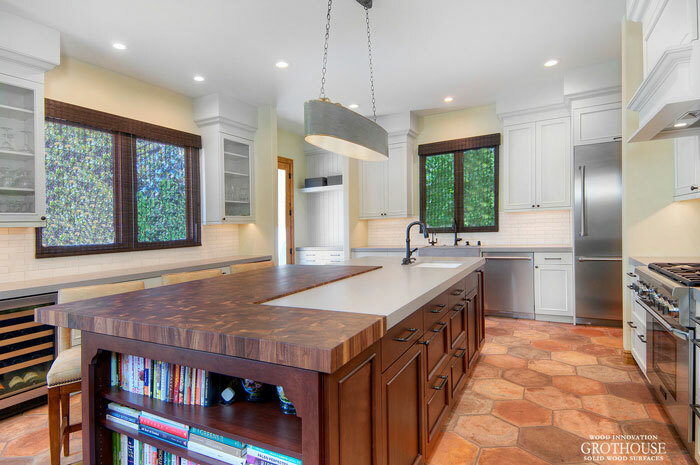 Visit the Countertop Image Library to see more black white kitchens with wood countertops and butcher blocks. 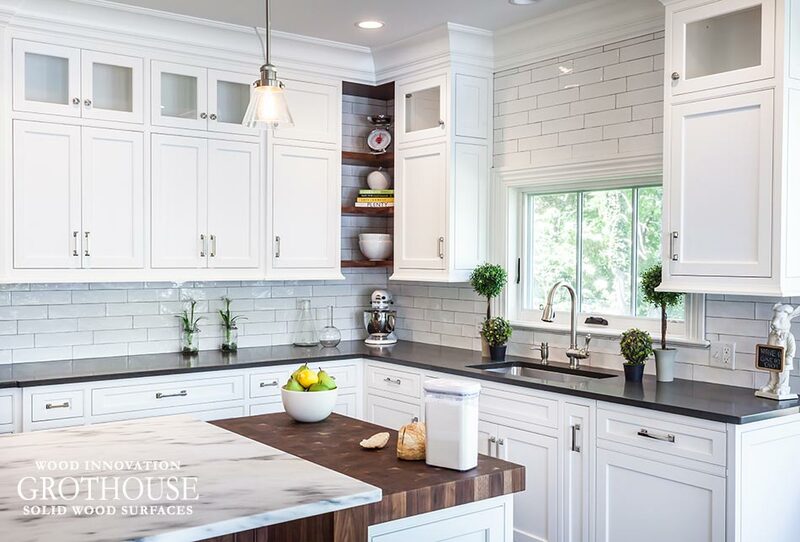 According to Houzz, subway tile backsplash is one of the best options to pair with wood countertops – and we couldn’t agree more. 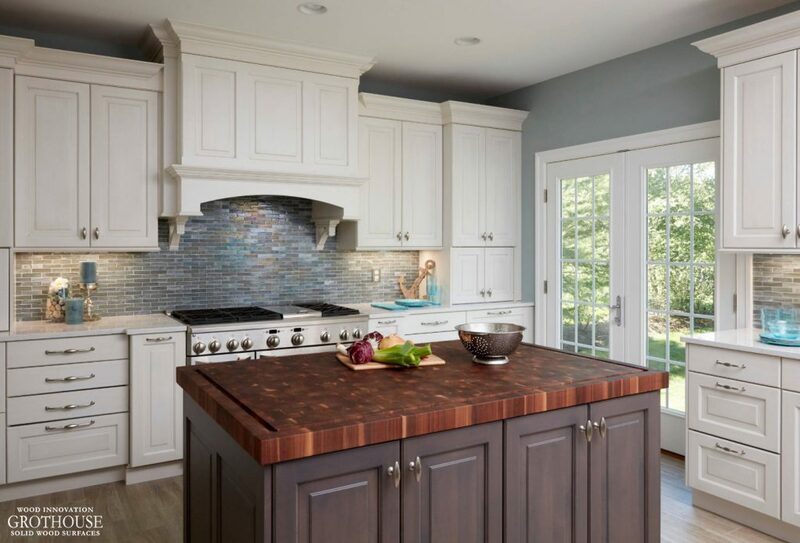 Much like custom wood countertops, the classic look of subway tile is extremely versatile, permitting it to be easily paired with just about any kitchen style. 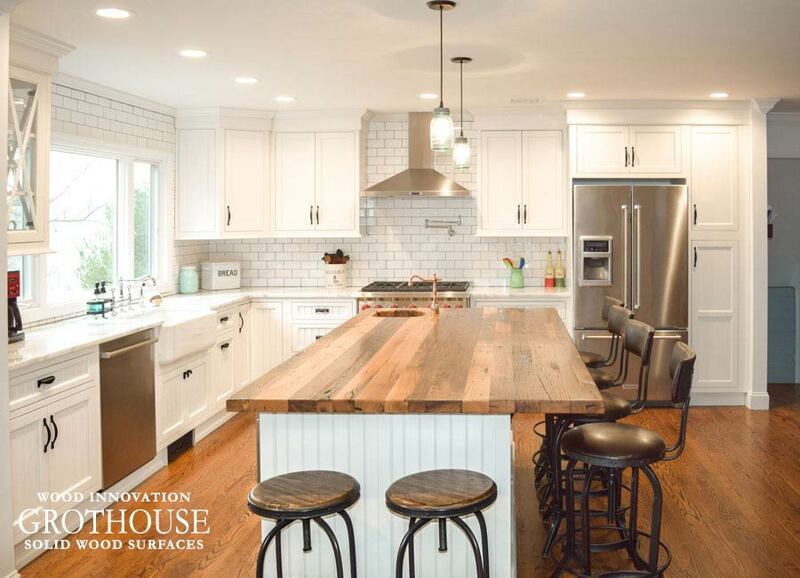 Farmhouse is one of the most common kitchen styles featuring subway tile and wood counters. 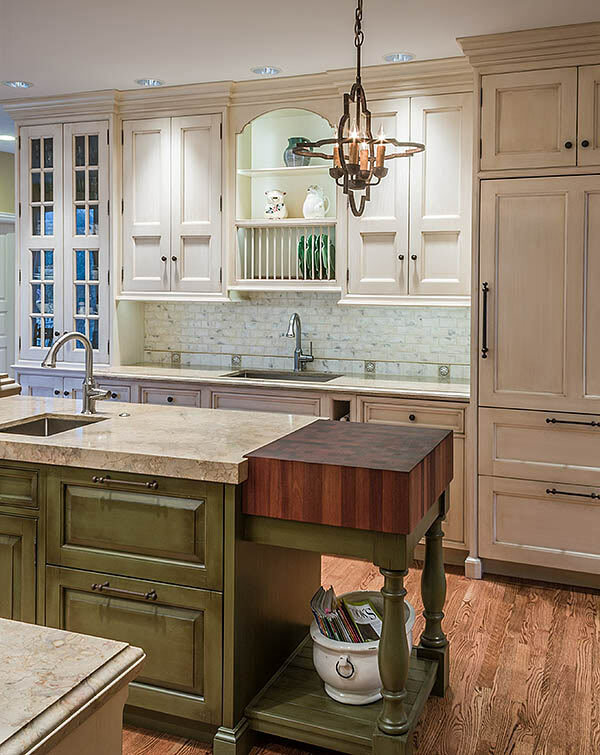 Farmhouse style is often mixed with other kitchen styles, such as industrial and modern. 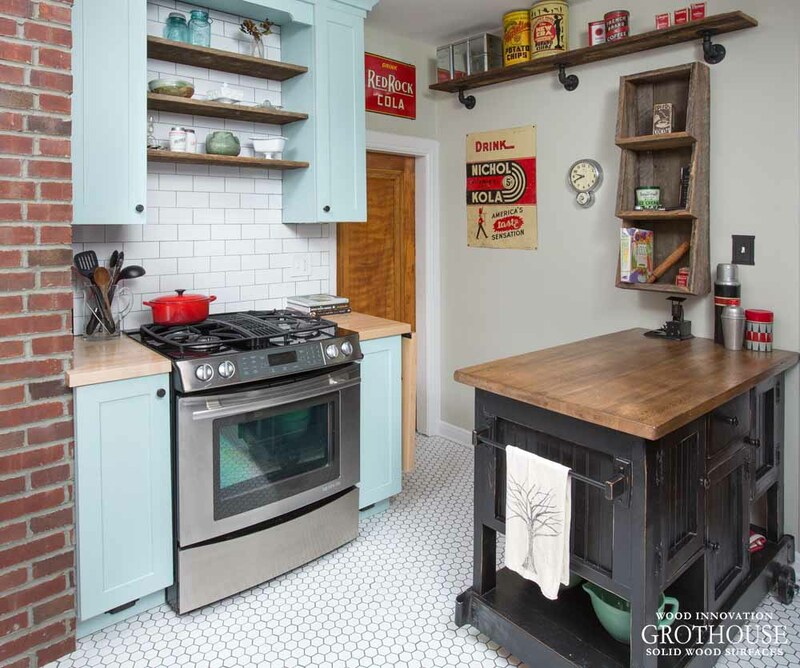 Griffey Remodeling designed this small farmhouse industrial style kitchen to include a white subway tile backsplash and maple wood countertops. 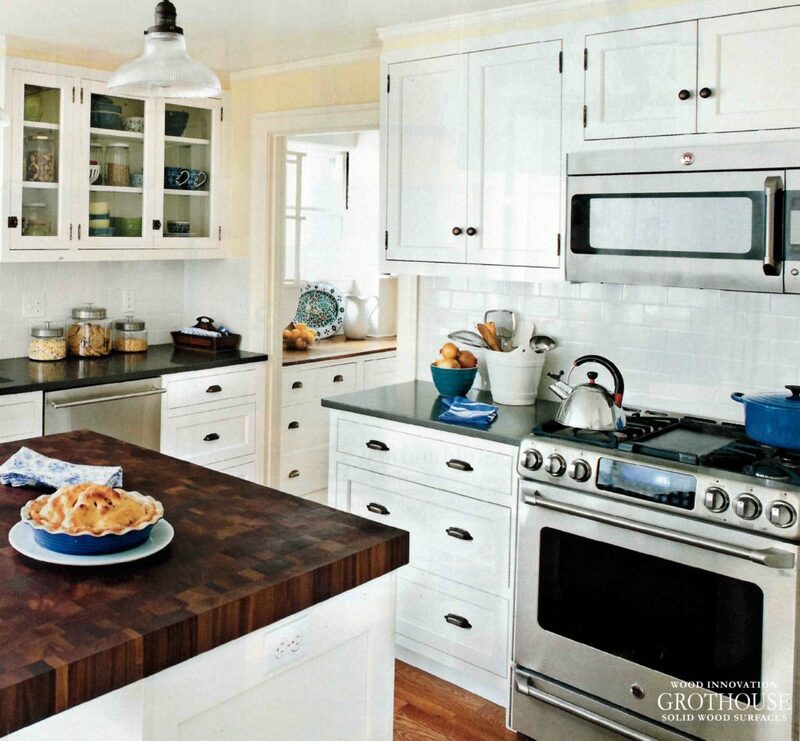 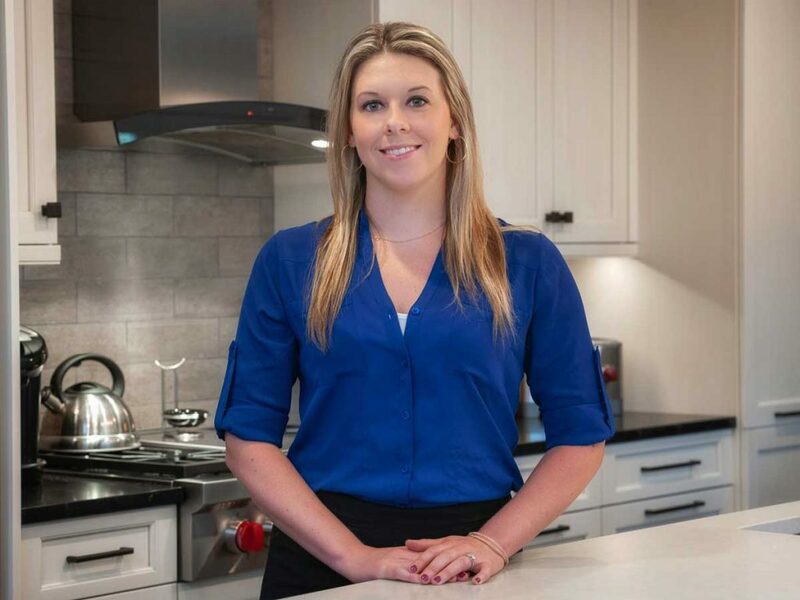 Phoebe Steinhoff-Smith of Coastal Cabinet Works mixed modern and industrial farmhouse style in this white kitchen. 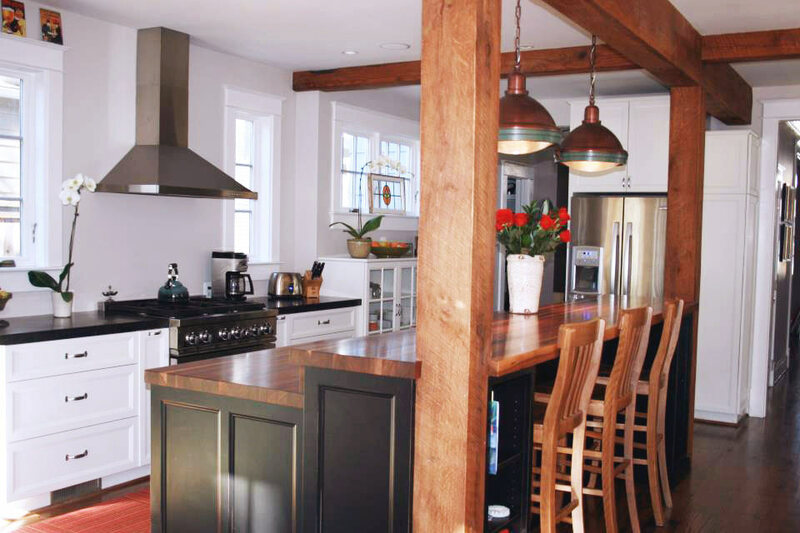 A large Reclaimed Oak counter was designed for the kitchen island. 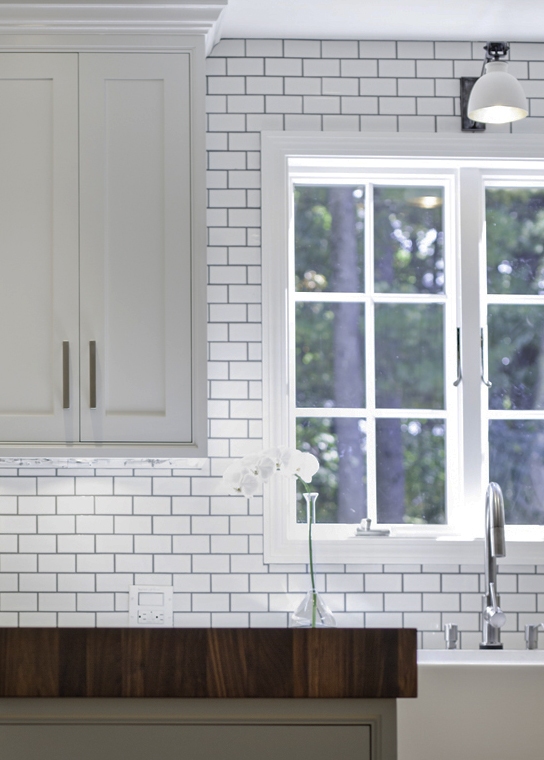 The subway tile backsplash is continued all the way to the ceiling, making the room feel larger. 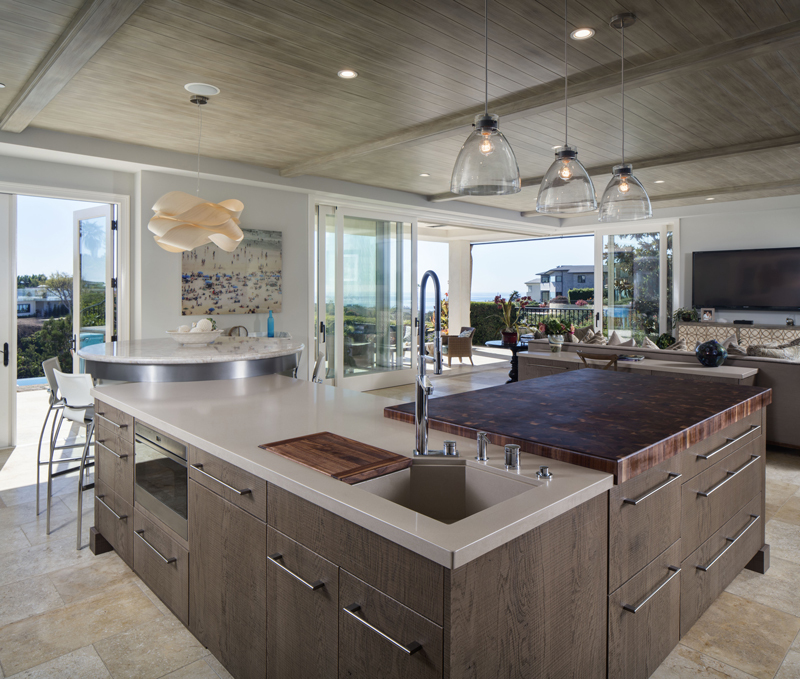 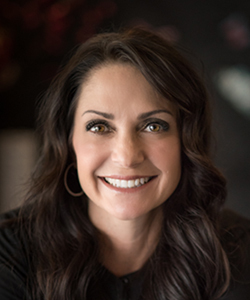 Designed by Shawna Dillon of Studio Snaidero D.C. Metro, this transitional/modern kitchen won the Kitchen & Bath Business magazine’s Showroom of the Year 2016 Award. 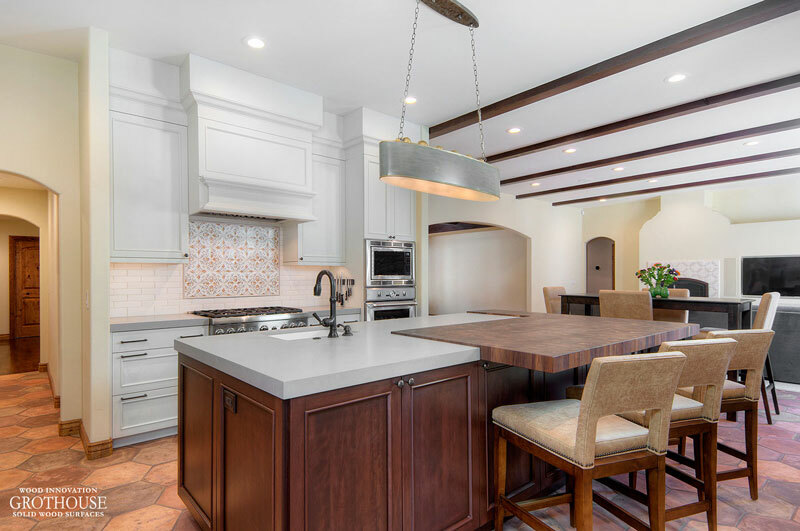 This award winning kitchen features walls of white subway tile and a Reclaimed Chestnut kitchen bar top. 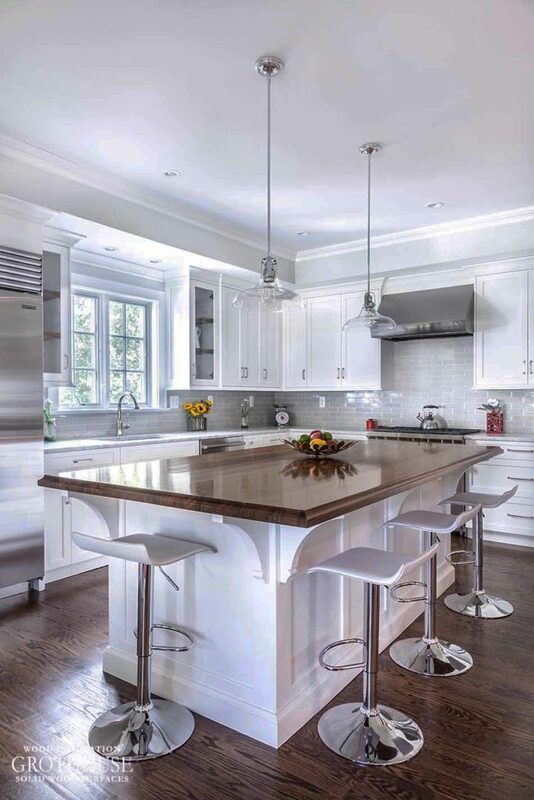 White subway tile is a popular choice, but colored subway tile is often used as well. 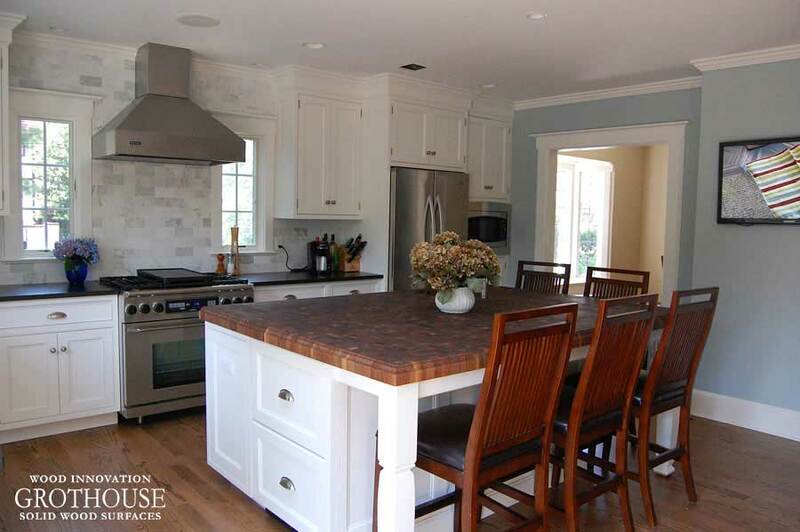 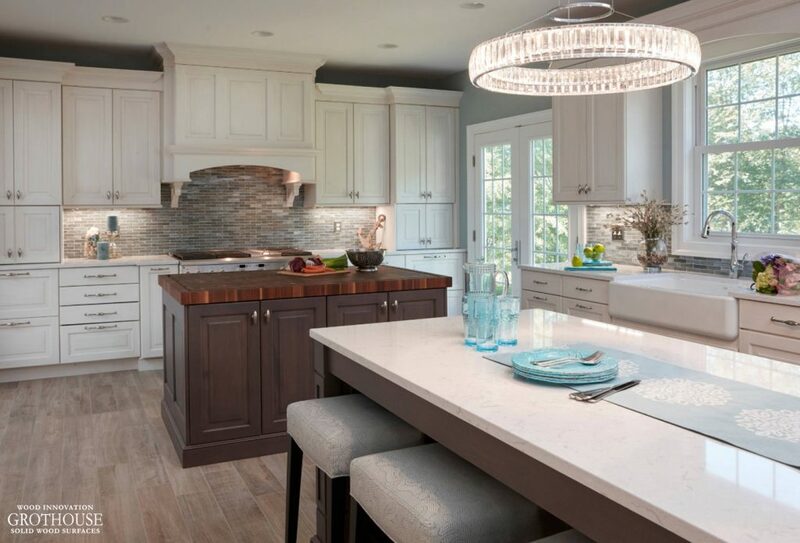 Stonington Cabinetry & Designs chose a light gray subway tile for this transitional kitchen. The kitchen island includes a large Walnut countertop. 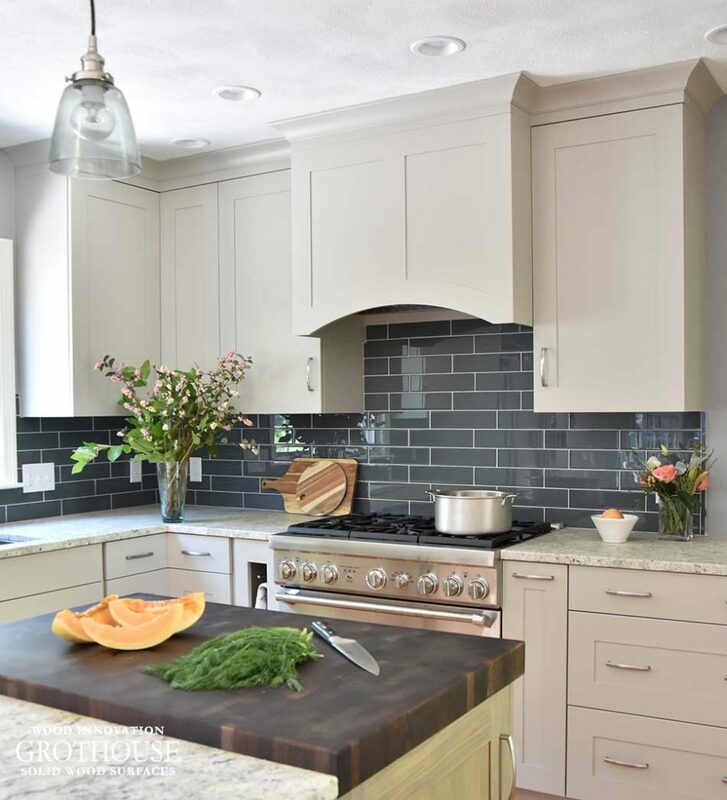 Kate Connolly of Homestead Kitchens went with a soft, dark blue subway tile backsplash that continues along the wall under the cabinets. 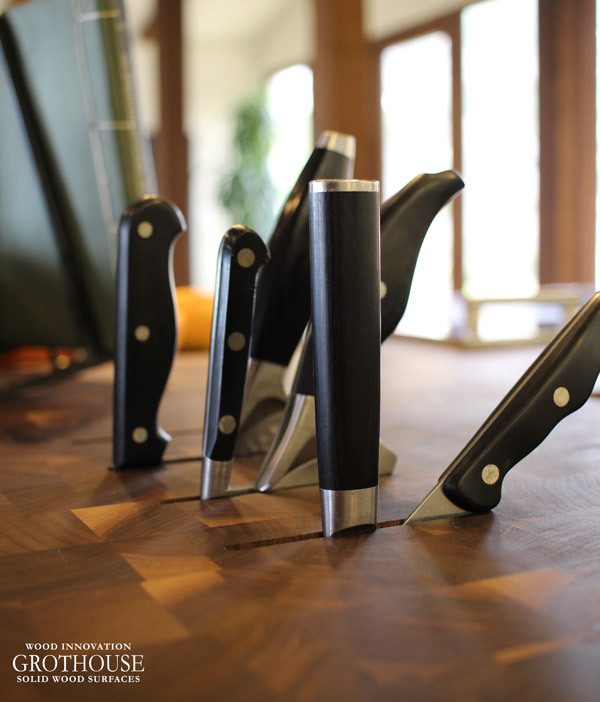 Conveniently located across from the range is a Wenge butcher block. 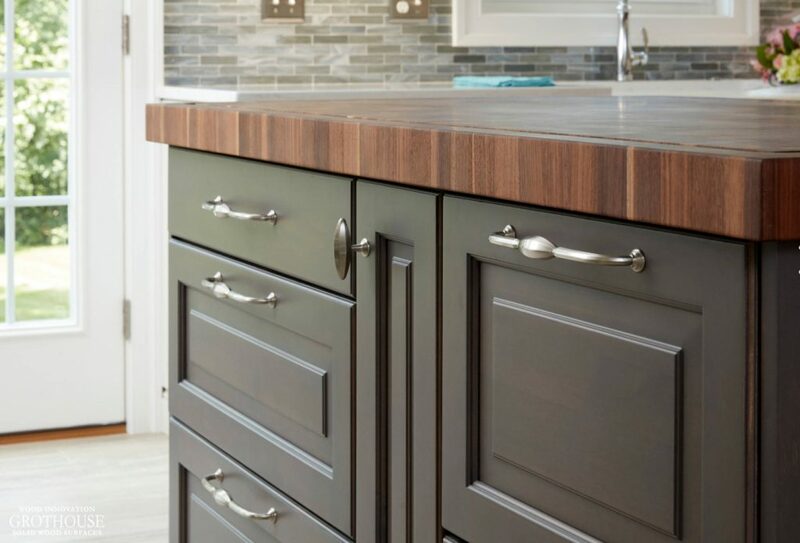 A distressed Sapele Mahogany counter was paired with a tan subway tile for this traditional style wet bar designed by Wood-Mode Inc.
Due to their design versatility, subway tile backsplash and wood countertops make the perfect pair. 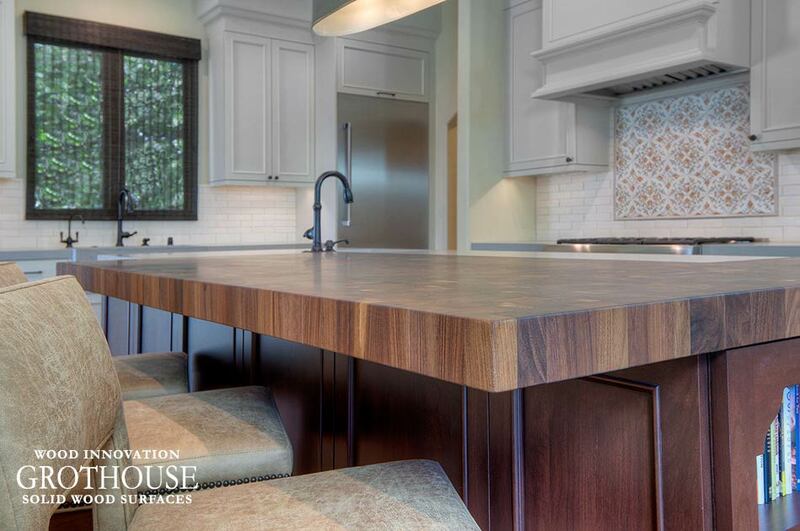 To see more designs featuring this pair, visit the Grothouse Countertop Image Library.